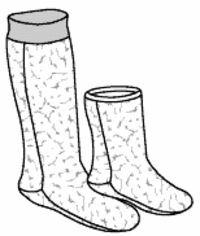 I promised my 16 Polar Sock class participants last night that I would post these links to simplify their searches for high quality fleece. We used the Green Pepper – 504 Polar Sock pattern and had a lot of fun! Thank you all for participating! love the idea of the polar sox…got a friend that really really needs these…where can I get the pattern in Canada , pls ?? http://www.seattlefabrics.com/green.html#GP504 Polar Socks also ships to Canada. I asked my friend Connie Bontje (Ontario) and she suggested this company in Calgary. http://www.peakfabrics.com/pattern/peak The pattern looks very similar. Note, the jalie pattern suggests fleece that stretches both ways rather than the standard polartec. You might try emailing the Green Pepper folks at Info@TheGreenPepper.com to see if they have Canadian retailers. This place also has the pattern. http://www.rockywoods.com/ however the total cost of the pattern and shipping to Canada was about $20.00 according to another friend.